Hindi Lyrics 4 U: Lyrics Of "Hairate-E-Aashiqui" From Latest Movie - Yea Toh Two Much Ho Gaya (2016). Lyrics Of "Hairate-E-Aashiqui" From Latest Movie - Yea Toh Two Much Ho Gaya (2016). 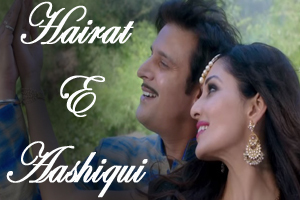 Beautiful romantic song in the voice of Javed Ali, Aakanksha Sharma featuring Pooja Chopra, Jimmy Sheirgill. Lyrics in Hindi (Unicode) of "हैरत-ए-आशिकी"